The African-American Ministry was established at Saint Columba on November 2, 2003, Fr. Michael King, Pastor. The mission of the Ministry is to enhance the contributions and participation of African-American Catholics and to educate all involved by sharing their rich and vibrant history. The Ministry serves as a vital connection with the Archdiocese of Washington Office of Black Catholics, the National Black Catholic Congress and neighboring Parishes. The Ministry serves and supports the Church and broader community by embracing diversity and encouraging unity through the performance of charities and development of enrichment programs. These efforts enhance the spiritual lives of all participants. Regular meetings are held the first Wednesday of each month at 7pm in the library, Fr. Dewan Hall. Membership is open to all who are in accord with the mission of the Ministry. For many years, Josephine Bakhita was a slave, but her spirit was always free and eventually that spirit prevailed. Born in Olgossa in the Darfur region of southern Sudan, Josephine was kidnapped at the age of seven, sold into slavery and given the name Bakhita, which means fortunate. She was resold several times, finally in 1883 to Callisto Legnani, Italian consul in Khartoum, Sudan. Two years later he took Josephine to Italy and gave her to his friend Augusto Michieli. 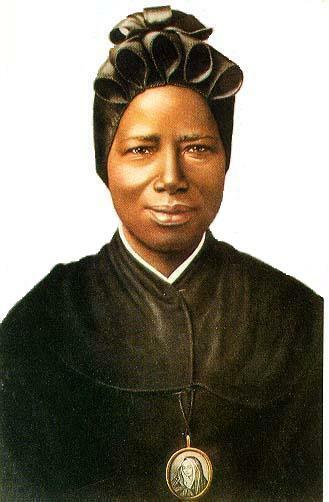 Soon Bakhita became babysitter to Mimmina Michieli, whom she accompanied to Venice's Institute of the Catechumens, run by the Canossian Sisters. While Mimmina was being instructed, Josephine felt drawn to the Catholic Church. She was baptized and confirmed in 1890, taking the name Josephine. When the Michielis returned from Africa and wanted to take Mimmina and Josephine back with them, the future saint refused to go. During the ensuing court case, the Canossian sisters and the patriarch of Venice intervened on Josephine's behalf. The judge concluded that since slavery was illegal in Italy, she had actually been free since 1885. Josephine entered the Institute of Saint Magdalene of Canossa in 1893 and made her profession three years later. In 1902, she was transferred to the city of Schio (northeast of Verona), where she assisted her religious community through cooking, sewing, embroidery and welcoming visitors at the door. She soon became well loved by the children attending the sisters' school and the local citizens. She once said, "Be good, love the Lord, pray for those who do not know Him. What a great grace it is to know God!" The first steps toward her beatification began in 1959. She was beatified in 1992 and canonized eight years later. Saint Monica was born in 332 at Tagaste in Roman North Africa (modern day Algeria). Her devoutly Christian parents were native Africans. When Monica was twenty-two years of age her parents betrothed her to Patricius, a violent tempered, adulterous pagan twice her age. He and his cantankerous mother were unkind but Monica decided to pray for their conversion to the Christian faith. The marriage of Monica and Patricius produced three children (Augustine, Navigius, and Perpetua).Augustine the eldest was drawn to youthful carousing and loose living. Monica prayed constantly for his conversion and baptism. Augustine stood firm against both. Monica’s prayers for Patricius, however, bore fruit after 16 years of marriage. His conversion came shortly before his death. Patricius’ mother eventually, too, became a Christian. She fell ill that same year at Ostia, Italy. Her family was preparing to return to Tagaste so that she could be buried next to her husband. Monica indicated that she wanted to be buried wherever she died. “Nothing is far from God,” said she. Her relics were later moved from Ostia to Rome to rest in the Church of Sant’ Agostino. Saint Monica’s feast day is August 27. For links to very informative and useful websites/pages, please click on the "Links" at the submenu on the left side of this page. The flyer about the Thanksgiving Baskets and Adopt-A-Family Christmas Drive is at the submenu on the left side of this page. To join this ministry, please call any officer/member of the ministry.